"Wings Over Honolulu" was a 1937 film directed by Henry C. Potter staring Wendy Barrie as Lauralee Curtis and Ray Milland as Lieutenant Jack Furness. The plot outline was a Navy pilot gets involved in a romantic triangle while stationed in Hawaii. The film was low budget with a bad plot, but the Navy agreed to assist with the action scenes that were later cut to five-minutes in an 80-minute film. However, the film managed a 1937 Oscar nomination for best cinematography, but Joseph Valentine for "Wings Over Honolulu," and Gregg Toland for "Dead End" lost in the balloting to Karl Freund for "The Good Earth." In February of 1937 Clark was promoted to commander. He was serving aboard the USS Lexington (CV-2), and was appointed liaison officer between the Navy and movie people. 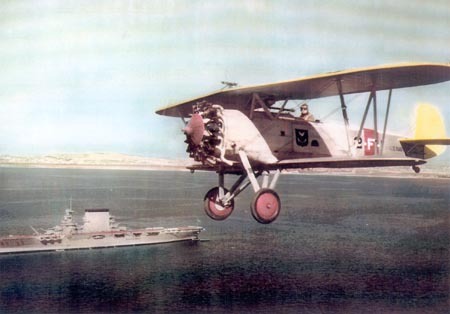 The Navy flew the planes, and provided the film's action and authenticity. The above picture is a frame from the film. Commander "Jocko" Clark is at the controls of the Boeing F4B biplane, the Lexington is below. Photograph of Commander Clark courtesy of William D. "Bill" Beatty nephew of Admiral Joseph James "Jocko" Clark. © 1999-2003 Utility Press Inc. All rights reserved. Copyright claim exclusive of photograph.